Mitchell Byrd and Craig Koppie transporting falcons to a hack site. Following an eight-year reintroduction program on the Coastal Plain, a second reintroduction effort was initiated in the mountains of Virginia in 1985. The objective of this effort was to establish breeding pairs within the historic range of the peregrine in Virginia. A series of hack sites were established within, or near, mountain sites where it was believed that conditions were suitable for future breeding. Between 1985 and 1993, 130 captive-reared peregrines were released within the mountains. See below for descriptions of hack sites and details of releases within individual sites. Photos by McGregor McCance and CCB. Big Schloss is located in the George Washington National Forest approximately 19 kilometers west of Woodstock, VA on the state line between West Virginia and Shenandoah County, VA. The box was positioned facing east on a 30 meter cliff along a north-south oriented ridge. Good views of the box were afforded from other rocky outcrops along the same ridge making it easier for hack attendants to keep up with the young falcons. A mixed oak/pitch pine forest covered most of the top of the ridge and surrounding valley, with a dense understory of mountain laurel. Although used for only two years in 1988 and ’89, Big Schloss was quite successful as a hack site. It afforded excellent views of the valley below and was rich in bird diversity for potential prey. These characteristics also made it a good destination for hikers which descended in great numbers on the site throughout the summer. So although it made an admirable platform for reintroducing young falcons, the human visitation will probably preclude it from selection as a suitable nest site for a breeding pair. This mountain hack site was located on the 11,000 hectare Clinch Mountain Wildlife Management Area spanning portions of 4 counties in southwest Virginia: Russell, Smyth, Tazewell, and Washington. Typical of the Appalachian Plateau, the habitat is mixed with numerous cliffs and rock outcrops common. Local relief varies from 730 to 1370 meters. 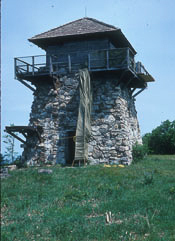 The hack tower was erected here just prior to the first and only year of use for this site, 1985. The tower was 5 m tall and positioned on a knoll facing northwest at an elevation of approximately 1200 meters. It overlooks a long, marshy bowl known as Panther Lick, a little over 6.5 km northwest of the town of Saltville, VA. This site was one of two that marked the beginning of the mountain reintroduction effort in 1985. Unfortunately, the Clinch Mountain site was plagued with Great Horned Owl problems, which were believed to have lead to the premature disappearance of 3 of the 6 young falcons. Although this area was very near a known historical nest location, it was agreed that the owl problems were enough to discontinue use of the site for future releases. Cole Mountain is located in the Pedlar Ranger District of the George Washington National Forest approximately 24 kilometers east of Buena Vista, VA. The hack box was placed on a 3 meter tower situated on the east slope of a grassy bald just below the 1200 meter peak. It faced the cliffs of Mount Pleasant located 2 km to the east. First used in 1988, this hack site made use of the Appalachian Trail for quick access to a nearby road where supplies could be brought in. Although it was ultimately used for three years, it never had a perfect release season as shown in the table below. It was thought that a number of the unsuccessful birds ended up on the ground during their early flights. The dense vegetation around this site may have then prevented their escape and doomed them to predation. List of Hack Attendants: John Cornett, Cary Cowlbeck, Frances Demmerle, Kristen Hallwachs, Other names unavailable. Roanoke emerged as the only urban release site in the mountain reintroduction effort. At the root of this release was the city’s hope that young falcons would return to nest there and ultimately assist with the growing pigeon population. The Downtown Roanoke Association was instrumental in making this hack possible with the Mill Mountain Zoo assisting with coordination and administrative support. The hack box was placed on the roof of the Norfolk and Western Railroad building downtown. The hack attendants conducted observations from next door on the roof of an adjacent bank building. Although downtown Roanoke has not yet appealed to a nesting pair, this site was at least successful in fledging its entire contingent of young falcons. List of Hack Attendants: William Zawacki, Other names unavailable. Located approximately 22 kilometers due west of Staunton, VA, Elliott Knob can be found on Great North Mountain in the George Washington National Forest. At 1,360 meters it is the GW’s highest peak. 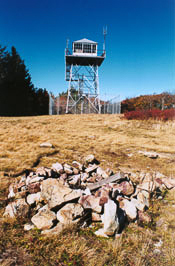 The release site made use of an existing fire tower that was present on the ridge, now joined by a growing number of communications towers. A popular hiking route, the trail up to Elliott Knob was less convenient for the frequent transport of food and supplies to the hack attendants. It had been chosen primarily because a few extra birds were made available for hacking after the other active hack sites were at full capacity. In the end it served its purpose well as a back-up hack site, but its remoteness and inaccessibility kept it off the list for additional releases. Franklin Cliffs was established as a sister site to Hawksbill Mountain to accommodate an unusually large number of young falcons for release in 1991. Less than 3 kilometers from Hawksbill it was located along the Skyline Drive, just east of Big Meadows in Shenandoah National Park. Its proximity to Hawksbill also greatly enhanced the odds for future nesting pairs in the Park. Despite its dramatic overlook and rocky ledges, Franklin Cliffs was perhaps a little too close to Skyline Drive and the Appalachian Trail to afford the degree of seclusion really desirable for hack sites. As a result, it was only used for one year. Hawksbill won out as the preferred site for long-term use in the Park. List of Hack Attendants: Britt Argow, Ivy Hamby. At 1,239 meters, Hawksbill Mountain is the highest point in Shenandoah National Park. It is located approximately 19 kilometers south of Luray, VA, just inside Madison County’s western border. The hack box sat on a cliff about 15 m. tall that runs east-west for about 185 m. just below the summit. Access to the site was by way of scenic Skyline Drive, followed by a nearly 2 km hike up to the cliff edge. From there an observer could look out over the Appalachian Trail and across the Shenandoah Valley to the Massanuttens. Surrounding the immediate area was predominantly a rich hardwood forest with a dense shrub understory of witch-hazel, striped maple, and hawthorn. Hawksbill was first used as a hack site in 1989. With its easy accessibility, excellent observation area, and relative freedom from predators it ultimately won out as the most desirable hack site in the mountain reintroduction effort. Thirty-six young falcons were released there over a five year period and all but 2 fledged successfully. Despite the intense visitation by hikers and sightseers, it proved to be both a biologically sound and educationally rewarding experience for all involved. List of Hack Attendants: Amanda Allen, Amy Ehrgott, Dan Langdon, Mandy Marvin, J.J. Morgan, Michael, O’Bryon, Jr., Mark Stoetzer, Craig Tumer, Eric Wilson. This release site was located in the George Washington National Forest approximately 32 kilometers west of Harrisonburg, VA. The hack box was placed on a stone fire tower located on the state border between Rockingham County and West Virginia at an elevation of 1250 meters. Surrounding the hack site was a forest canopy of primarily oak with other mixed hardwoods and a dense understory of Mountain Laurel. This site was first established in 1989 and was not immediately embraced as a good site. Visibility of the birds was limited once they began to fly, and many of the available perch sites were within reach of ground predators. The first year was plagued with numerous rain storms and dense fog for much of the time as well. Despite these shortcomings, the High Knob site proved to be one of the most successful hack sites of the mountain reintroduction effort. List of Hack Attendants: Joey Atkins, Christopher Dassler, Anthony Goad, Mark Jones, Brian Nicholson, Amy Reid, Mark Stoetzer. This release site was located one kilometer north of Grayson Highlands State Park in Grayson County, just inside the Mount Rogers National Recreation Area. The hack box was situated on the tallest of three large outcroppings approximately one half kilometer apart oriented north-south along the crest of a rocky, pastured ridge known as Wilburn Ridge. All three of these rock outcroppings exceeded 1585 meters in elevation and are located less than 3 km southeast of the summit of Mt. Rogers (Virginia’s highest point at 1609 m.). Rocky pasture, dense rhododendron thickets, and spruce-fir forest make up the surrounding habitat. Notable for this site was the fact that the Appalachian Trail runs north-south within sight of the hack site, and a spur trail off the A.T. actually traverses the ridge that was used for the release. Hack attendants were forced to close this spur trail during the release effort, although much time was spent responding to curious hikers. Despite the 6.5 mile roundtrip hike to replenish supplies each week, the hack attendants were treated to the calls of Northern Saw-whet Owls by night and awakened to the trills of juncos and Vesper Sparrows each morning. This site was used with good success for the first two years of the mountain reintroduction effort beginning in 1985. List of Hack Attendants: Dana Bradshaw, Joel Clark, Kathy Kyle, Russ Melton.